2 Philippine Institute of Volcanology and Seismology. 3 Philippine National Oil Corporation. 4 University of the Philippines. The eruptive history of Mount Pinatubo is divided into two parts--eruptions of an ancestral Pinatubo (~1 Ma to an unknown time before 35 ka) and eruptions of a modern Pinatubo (>35 ka to the present). Ancestral Mount Pinatubo was an andesite-dacite stratovolcano for which we have no evidence of large explosive eruptions. Modern Mount Pinatubo is a dacite-andesite dome complex and stratovolcano that is surrounded by an extensive apron of pyroclastic-flow and lahar deposits from large explosive dacitic eruptions. Eruptions of the modern Pinatubo occur episodically, in eruptive periods that are short in comparison to intervening reposes of several centuries or millennia. Eruptions may be getting smaller with time, and repose periods shorter, though some of the apparent trend toward smaller eruptions and shorter reposes may be an artifact of erosion and (or) burial of older deposits. The explosive eruption of June 15, 1991, is one of the smallest we can identify in the geologic record, and the 500-year repose that preceded that eruption is relatively short for Pinatubo. Rocks of prehistoric eruptions and the 1991 eruption of Mount Pinatubo are very similar and record evidence of repeated basaltic intrusion into a large, gas-charged dacitic body. Explosive eruptions followed, as did, in at least some instances, growth of late-stage lava domes. Before April 2, 1991, volcanologists knew Mount Pinatubo as an inconspicuous volcano, active within the past millennium, and the site of an aborted geothermal development. Indigenous people of the area, Aetas, knew Mount Pinatubo as their home, their hunting ground, and their haven from an ever-encroaching lowland population. For the Aeta, Mount Pinatubo was (and is) the home of Apo Namalyari, the Great Protector and Provider. A much larger population in the surrounding lowlands, including those in nearby military bases, barely knew of Mount Pinatubo at all, save for a few who climbed for a respite from the heat and hassles of lowland life, and for military personnel who received survival training from the Aetas. Until June 1991, Mount Pinatubo (15°08.2' N., 120°21.1' E.) rose 1,745 m above sea level but only about 600 m above a gently-sloping apron and only 200 m above nearby mountains that largely obscured Mount Pinatubo from view (figs. 1, 2). The surrounding mountains are older volcanic centers and relics of an ancestral Mount Pinatubo, which is discussed below. The gently-sloping apron consists of thick pyroclastic-flow and lahar (volcanic mudflow) deposits. This paper summarizes what we learned of Pinatubo's eruptive history before and since the major eruption of June 1991. Figure 1. Location map for Mount Pinatubo and central Luzon. Figure 2. Preeruption Mount Pinatubo, as seen from the north. The geology of the Pinatubo region is described by Corby and others (1951), Roque and others (1972), de Boer and others (1980), Philippine Bureau of Mines and Geosciences (1982), Hawkins and Evans (1983), Schweller and others (1983), Delfin (1983, 1984), and Delfin and others (1992; this volume). Briefly, Pinatubo is flanked on the west (and partially underlain) by the Zambales Ophiolite Complex, an easterly-dipping slab of Eocene ocean crust uplifted during the late Oligocene (Villones, 1980). North, east, and southeast of Pinatubo, late Miocene to Pliocene marine, nonmarine, and volcaniclastic sediments of the Tarlac Formation (Roque and others, 1972) are believed to unconformably overlie the Zambales Ophiolite Complex (fig. 3). The Zambales Ophiolite Complex west and northwest of Pinatubo is dominantly peridotite and gabbro; that north of Pinatubo is dominantly basalt (Hawkins and Evans, 1983). The Zambales ophiolite complex encountered southeast of Mount Pinatubo, from 1,100 m to 2,733 m below the surface in geothermal exploration hole PIN-1 (see Delfin and others, this volume), is dominated by microdiorite and diabase dikes, with lesser amounts of hornfels, basalt, gabbro, and monzodiorite (Aniceto-Villarosa and others, 1989). Interestingly, rocks from the ophiolite complex rarely occur as xenoliths in Pinatubo volcanic rocks, despite their probable continuity beneath the volcano. The ophiolite, topographically high west and northwest of Mount Pinatubo, is apparently downdropped to the east across an unnamed north-south fault, about 10 km west of Mount Pinatubo (fig. 3; Delfin and others, this volume). The lower part of the >1,000-m-thick Tarlac Formation is dominated by fossiliferous sandstone and siltstone and unconformably overlies the Zambales Ophiolite Complex. The upper part of the Tarlac Formation is dominated by conglomerate with sandstone lenses cut by andesite dikes. Near the southern end of Crow Valley (see fig. 7), ash-flow tuffs unconformably overlie sedimentary layers and, along the Malago and Marimla Rivers, sediments of the Tarlac Formation are overlain by lavas and intruded by the dome of Mount Mataba (fig. 3). Volcanics of the Tarlac Formation originated from the same east-dipping subduction along the Manila trench that continues to the present. de Boer and others (1980) and Datuin (1982) report a general trend from tholeiitic rocks on the west to slightly alkaline rocks on the east, with calc-alkaline rocks dominating the main volcanic belt. Some Miocene and Pliocene volcanic centers have now been exhumed to the level of subvolcanic intrusions, such as the diorite of the Dizon Mine (fig. 3). de Boer and others (1980) described the Iba fracture zone, a major northwest-trending fracture zone of which Delfin's (1983, 1984) Maraunot fault is perhaps a part (fig. 3). The same authors noted that Mount Pinatubo lies at the intersection of the Iba fracture zone and the volcanic arc. 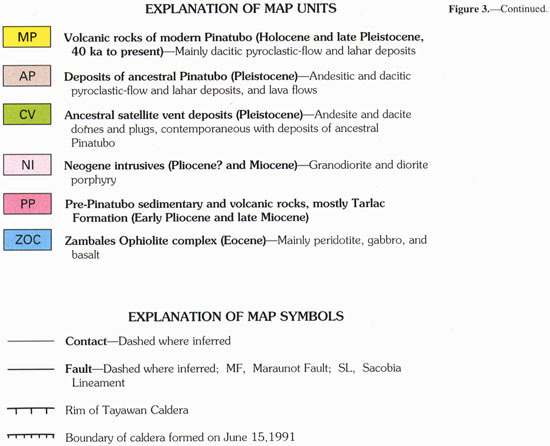 Defant and others (1991) described rocks of Mount Pinatubo in relation to others of the Luzon Arc. Figure 3. 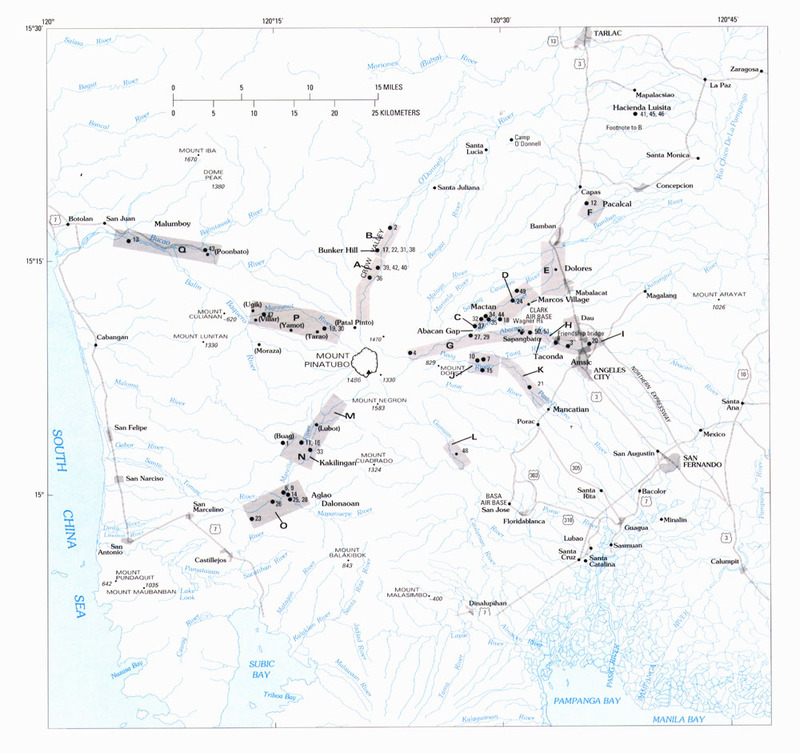 Generalized geologic map of Mount Pinatubo and environs (after Philippine Bureau of Mines (1963) and Delfin (1983, 1984)). Altitude in meters. Our oldest references to volcanic rocks from Mount Pinatubo are accounts by von Drasche (1878), Oebbeke (1881), and Jordana y Morera (1885), describing the mineralogy and texture of pumice in tuffs in the vicinity of Porac, Magalang, and along the O'Donnell River. Von Drasche described a sample from Porac that was "spongy, brilliant white trachyte pumice, with large fractured sanidine and short column-shaped hornblende crystals in the vesicles." 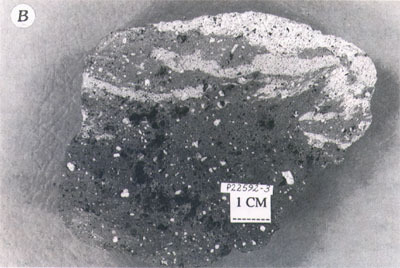 Oebbeke described the Magalang sample as pumice with green hornblende, plagioclase (An55), and mica, the first two with glass and fluid inclusions. Jordana y Morera described "dolerite" (andesite) and gabbro, referring either to lavas and intrusive equivalents of Pinatubo area vents or to cobbles eroded from the Zambales Ophiolite Complex. None of these authors mention Mount Pinatubo, but Jordana y Morera clearly recognized a nearby volcanic source for these rocks, and von Drasche reported that his "trachyte nodules" (pumice clasts) increased in size toward the Sierra of Zambales (toward Pinatubo). The first geologic commentary about Mount Pinatubo itself was by Smith (1909), who, after describing the "Aglao Valley" (Marella River valley) as once filled to a depth of 120 to 150 m with loose sand and boulders, then described Mount Pinatubo as devoid of "volcanic ash (and) any of the usual indications of volcanic activity." Smith concluded that "Mount Pinatubo is not a volcano and we saw no signs of it ever having been one, although the rock constituting it is porphyritic .... The region is quite unique and I have seen nothing in the Philippines quite like it." Decades later, economic geologists noted Pinatubo's sulfur deposits (Jagolino, 1973) and Pinatubo's lahar deposits as a source for lightweight pumice aggregate (Cruz, 1981). Three radiocarbon ages and a number of chemical analyses of Pinatubo rocks were published in site-safety documents for the Philippine Nuclear Power Plant #1 (Ebasco Services, Inc., 1977); these same ages were reported, together with an interpretation of aerial photography, by Wolfe and Self (1982, 1983). More recently, the overall geology of Pinatubo was studied as part of a geothermal exploration program (Delfin, 1983, 1984). Delfin (1983, 1984) recognized two suites of Pinatubo units, "old" and "young." To emphasize Pinatubo's life history more than absolute ages, we will call these same suites "ancestral" and "modern" (fig. 3). Discussion of each suite follows. Much of the rugged terrain surrounding and partially obscuring the modern Pinatubo consists of relics of the ancestral Pinatubo (fig. 4). Ancestral Pinatubo was an andesite and dacite stratovolcano whose center was in roughly the same location as the modern Pinatubo. Projection of dipslopes upward from existing terrain suggests that the ancestral Pinatubo, if it was an isolated, central cone, could have been as high as 2,300 m. If the summit was complex, or rounded, the peak would have been lower. A high-silica andesite intrusive on the east flank of Pinatubo (UTM 1675.7N, 220.5E) yielded a K-Ar age of 1.10+-0.09 Ma (Ebasco Services, Inc., 1977). A similar age of 1.09+-0.10 Ma (Bruinsma, 1983) was obtained from a hornblende andesite lava on the western slope of the volcano. Today, ancestral Pinatubo is exposed in relict walls of an old 3.5x4.5-km caldera, recognized by Delfin (1983, 1984) and named here the Tayawan caldera (fig. 3). 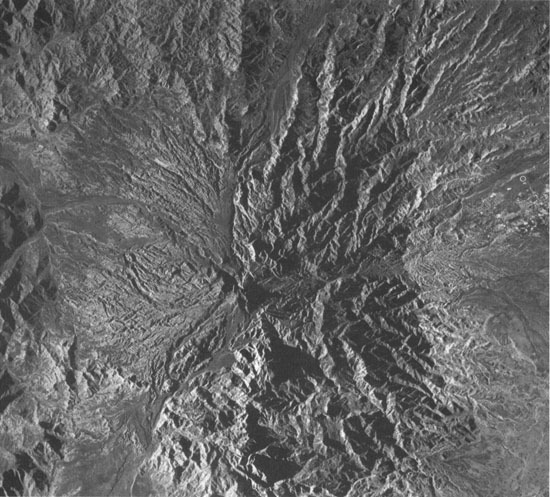 Prominent points on the relict rim of that caldera include Mount Donald Macdonald (southeast caldera rim) and Mount Tayawan (north-northeast caldera rim). Several patches of high, erosion-resistant terrain outside that caldera (for example, Mount Dorst) were part of the dip slopes of that ancestral Pinatubo (figs. 3, 4). Lava flows of the caldera walls and rim are mostly two-pyroxene-hornblende andesite (augite+hypersthene+-hornblende+-biotite; plagioclase=An60) and are interbedded with pyroclastic-flow and near-vent fall breccias. Lower on the volcano's flanks, deposits of ancestral Pinatubo are indurated, yellow-brown andesitic and dacitic breccias of mostly lahar origin. Deep erosion in the Sacobia, Porac, Marimla, and Porac River valleys, coupled with deep weathering and induration of its products, suggests that activity of the ancestral volcano ended several tens of thousands of years (or more) before the caldera-forming eruption and initial growth of the modern Pinatubo. Figure 4. Airborne side-looking radar (SLAR) images of Mount Pinatubo in (A) March 1991 and (B) November 1991. In the preeruption view (A), the steep cone of the modern Pinatubo lies within the Tayawan caldera (dashed line) of ancestral Pinatubo. In the posteruption view (B), the 1991 caldera replaces the northern two-thirds of the preeruption edifice; the center of the caldera is about 750 m north-northwest of the broad preeruption summit; the vent of the June 7-12, 1991, lava dome was about 1,000 m north-northwest of the preeruption summit. Data acquired by Intera Information Technologies for the Government of the Philippines, Department of Public Works and Highways (DPWH), and the National Mapping and Resource Information Authority (NAMRIA). Used with permission. Several nearby vents were active contemporaneously with ancestral Pinatubo. These include Mount Negron dome, Mount Cuadrado dome, the Mataba dome and adjoining Bituin plug, and the Tapungho plug (fig. 3) (Delfin, 1984). Mount Negron, situated 5 km south-southeast of Mount Pinatubo, is a 2x2.5 km, 800-m-high steep-sided dome built of glassy hornblende andesite lava with a K-Ar age of 1.27+-0.8 Ma (Bruinsma, 1983). Mount Cuadrado, 11 km south of Mount Pinatubo, is a 1.5-km-diameter, 600-m-high steep-sided dome of hornblende-pyroxene dacite, with an age of 1.59 Ma. The Mataba dome, 11 km northeast of Mount Pinatubo, is a 0.7x2 km, 300-m-high dome of biotite-hornblende andesite that intruded and upturned layers of the Tarlac Formation. The Bituin ("star") plug, 8.5 km north-northeast of Pinatubo and 3.5 km west of the Mataba dome, is about 400 m high, consists of hornblende andesite, and is either an eroded remnant of a volcanic neck or an intrusive plug. The plug at Tapungho, 14 km south-southwest of Pinatubo and 3.5 km southwest of Mount Cuadrado, is a small, 500-m-diameter, 300-m-high pyroxene-biotite-hornblende andesite feature of uncertain age. Our reconnaissance fieldwork on modern Pinatubo distinguished deposits of repeated, large explosive eruptions. Although a few deposits are lithologically, paleomagnetically, or morphologically distinctive, most are similar and are distinguished from each other in the field only by erosional breaks, paleosols, or widely different 14C ages. Widespread tephra marker horizons are absent, probably lost to erosion. Radiocarbon ages suggest that eruptions from the modern Pinatubo have been clustered in at least six and possibly as many as a dozen eruptive periods. Each eruptive period is short in relation to intervening repose periods (table 1, fig. 5). Each of these six eruptive periods of modern Mount Pinatubo is described below. More detailed, future mapping will probably add more eruptive periods to this scheme, especially in the period before 5,000 yr B.P. Figure 5. Radiocarbon ages of modern Pinatubo deposits, arranged in chronologic order (not necessarily in stratigraphic order). All ages except those of the three oldest samples are shown as their 1-sigma range in calibrated, calendar equivalence (calibrated minimum to calibrated maximum, from table 1). For sample 49, an arbitrary range of 1,000 yr was plotted; samples 50 and 51 are shown with open-ended arrows because the ages were beyond the limits of reliability for conventional radiocarbon determinations. Figure 6. Composite stratigraphic sections for major rivers of Mount Pinatubo. The sections were constructed from stratigraphic relations and 14C ages of multiple outcrops within the lettered boxes shown in figure 7. Where outcrops were discontinuous and stratigraphic correlations impossible, 14C ages are the principal tie between individual outcrops and the composite section. Sections are mostly along rivers, as follow: A-B, O'Donnell; C-F, Sacobia-Bamban; G-I, Upper Sacobia-Abacan; J-K, Pasig-Potrero; L, Gumain; M-O, Marella-Santo Tomas; and P-Q, Maraunot-Balin Baquero-Bucao. Radiocarbon sample numbers (in parentheses) refer to table 1; locations of samples and stratigraphic sections are given in figure 7. Vertical scales in meters. Abbreviations: pf, pyroclastic-flow deposit; df, debris-flow deposit; hcf, hyperconcentrated-flow deposit; asl, above sea level; bio, biotite; qz, quartz; hb, hornblende; mt, magnetite. Figure 7. Radiocarbon sample sites. Lettered boxes show the locations of stratigraphic sections from figure 6. These letters are also used, in conjunction with radiocarbon sample numbers, to identify 14C samples in the text. For example, "36-A" in the text refers to sample 36 of table 1 and of composite section A (fig. 6 and this figure). In addition, we show composite stratigraphic columns (fig. 6) for each of the 7 major watersheds of Pinatubo. River reaches to which these apply are shown by shading in figure 7, together with the locations of individual 14C samples. Figure 7 also serves as a location map for localities mentioned in the text that follows. In the following discussion of eruptive periods, radiocarbon ages are referenced by their sample number in table 1 (1 through 51) and the stratigraphic column in which they appear (A-Q). For example, 50-G refers to sample number 50 of table 1 and stratigraphic column G of figure 6. A word is necessary about the preeminent role that 14C ages play in our distinction of eruptive periods of the modern Mount Pinatubo. Ideally, one would decipher a volcanic stratigraphy by the use of superposition and other stratigraphic relations, aided by correlations of distinctive lithologies. Then, ages would be determined for key units and the age span of an eruptive period would be that between the ages of its oldest and youngest deposits. However, lacking adequate field time and exposures, before and since the 1991 eruption, and also lacking obvious lithologic distinctions between products of the various eruptive periods, we have defined eruptive periods on the basis of clusters of 14C ages. Given such strong reliance on 14C ages, the most reliable age for an eruptive event is one obtained from the bark or outermost wood of in-situ trees that were rooted in soil underlying the deposit to be dated. However, only a few of our samples are of bark or the outermost, youngest parts of rooted trees. Most samples are from unknown parts of trees that may have fixed atmospheric 14C several hundred years before the tree was actually killed by an eruption. For example, charcoal from one pyroclastic-flow deposit (22-B, table 1) is apparently 400 years younger than charcoal from an overlying pyroclastic-flow deposit (31-B), but the older sample is a loose fragment of charcoal while the younger sample is from the outer 1 cm of a standing, charred snag. In addition, pyroclastic flows and lahars can incorporate charcoal from older deposits; as a result, wide discrepancies can arise in ages within the same deposit. A possible example is the apparent, >900-yr difference between the ages of samples 34-C and 44-C, which are from 1 m apart in the same pyroclastic-flow unit. Some of the older ages for each eruptive period are possibly (indeed, probably) artifacts of inadvertently sampled pieces from the older, biologically inactive interior of trees, or of incorporation of charcoal from otherwise unsampled, older eruptive periods. A few ages might also be too young. For example, a younger age for sample 50-G than for 51-G, both from the same outcrop, may reflect air drying for sample 50-G versus oven drying for sample 51-G. Oven drying prevented the growth of mold that fixes modern carbon and might be hard to remove completely in preanalysis sample treatment. In the text of this report, a radiocarbon age is expressed in 14C years. All other ages are calendar years. Table 1. Pinatubo radiocarbon data. Table 2. Phenocryst minerals, whole-rock SiO2 content, and notes for samples from pre-1991 eruptive periods. Inararo Eruptive Period -- >35,000 14C yr B.P. The largest eruption in the history of modern Pinatubo occurred before 35,000 14C yr B.P. and deposited up to 100 m or more of pumiceous pyroclastic-flow material on all sides of Mount Pinatubo. These deposits, once a thick, widespread apron around Pinatubo, are now found as distinctively eroded "pinnacles," erosional remnants within a deep dendritic drainage network between the Abacan and Pasig-Potrero Rivers, between 100 and 500 m above sea level (figs. 6 and 7, section G). In a few locations, notably between the north and south forks of the upper Pasig-Potrero River, and in a southern channel of the Sacobia River just upslope from its divergence with the Abacan, the deposit is incipiently welded and exhibits columnar jointing. The main deposit of this eruptive period is the basal and volumetrically dominant part of the "Inararo pyroclastic-flow deposit" of Delfin (1984, p. 16-17), named after a village, Inararo ("plowed"; location 29, fig. 7), that was destroyed by the 1991 eruption. Charcoal samples 50-G and 51-G, from a single outcrop and horizon (figs. 6, 7), have respective ages of 30,390+-890 and >35,000 14C yr B.P. ; we take the latter to be more reliable. The Inararo pyroclastic-flow deposits contain pumice blocks of biotite-hornblende-quartz dacite with about 64-67% SiO2 (table 2). Relatively abundant biotite and quartz phenocrysts, and the only occurrence of euhedral quartz in the Pinatubo sequence, distinguish these deposits from those of younger eruptive periods. Cummingtonite is present as rims on hornblende phenocrysts in some of the pumice blocks, a relation that indicates that preeruption magmatic temperature and pressure were similar to those in the 1991 magma body. The absence of cummingtonite in pumice blocks from some outcrops, slight differences in weathering characteristics, and apparent onlap relations suggest that at least two separate pyroclastic-flow units are present within deposits of the Inararo eruptive period. The Inararo pyroclastic-flow deposits are more than 100 m thick in the proximal parts of the Sacobia-Pasig-Potrero pyroclastic fan, north to northeast of Mount Dorst, and are buried beneath alluvium at their distal end, at least 21 km from Mount Pinatubo's summit. Assuming an average thickness of 30 m over an area of 160 km2 of inferred deposit, we estimate an original volume in the Sacobia-Pasig-Potrero fan of about 5 km3 (bulk). The bulk volume of 1991 pyroclastic-flow deposit in the same fan is roughly 1 km3 (W.E. Scott and others, this volume). 1991 deposits in the Sacobia-Pasig-Potrero system are about one-fifth of the total volume of 1991 pyroclastic-flow deposits so, assuming a similar azimuthal distribution then and now, the Inararo pyroclastic flows might have had a volume of 25 km3. Nothing is known about the volume of additional tephra-fall deposit from this oldest eruption. We speculate that the Tayawan caldera (described above) formed in response to the large Inararo eruption of dacite magma. The caldera's size (3.5x4.5 km) is that which would be expected from an eruption of 10 to 15 km3 dense-rock equivalent (DRE) of magma (see Smith, 1979, fig. 2). Had the Tayawan caldera formed after one of the post-Inararo eruptions of Pinatubo, we would expect to find a larger, Inararo-age caldera outside the Tayawan caldera. We know of no evidence for a larger caldera. Although Pinatubo had numerous eruptions after the Inararo eruptions, the Tayawan caldera was only partially filled--apparently because there were deep valleys in the preeruption edifice or local collapses along the caldera rim that allowed rivers and the pyroclastic flows of subsequent eruptions to flow through, and past, those segments of the caldera walls that remain high to this day. In the overall evolution of Pinatubo, the >35 ka Inararo dacitic eruption followed andesitic stratocone formation (ancestral Pinatubo) and an apparently long repose; the eruption also marked the birth of the modern Pinatubo. Sacobia Eruptive Period -- ~17,000 yr B.P. An outcrop of two pumiceous, hot(?) debris-flow deposits capped by a silt layer, in the north bank of the Sacobia River opposite Clark Air Base (49-D, figs. 6, 7) is the only known remnant of what we speculate was an eruptive period about 17,000 years ago. An age of 14,480 14C yr B.P. (17,350 cal yr B.P.) was obtained from bits of charcoal in the silt. The debris-flow deposits, like many other deposits of the modern Pinatubo, contain two distinct pumice types--a dominant, white, coarsely porphyritic hornblende pumice and a tan-gray, finer grained pumice with the same mineralogy. A check of paleomagnetic vectors of clasts in one of these debris flows showed partial consistency from one clast to the next (8 out of 10 vectors were broadly north-pointing, with near horizontal inclination)--a pattern seen in perhaps half of the debris-flow units at this distance from Pinatubo. We interpreted this particular deposit as a debris-flow deposit on the basis of its interbedding with clearly fluvial units rather than on paleomagnetic grounds; alternatively, it and other units with similar, partial consistency of clast paleomagnetism, at this distance or less from Pinatubo, could have been emplaced by distal or secondary pyroclastic flows (see Torres and others, this volume). Without additional outcrops, we can say little about eruption(s) of this period other than to guess that, because these debris-flow deposits and their included pumice clasts closely resemble those of the 1991 eruption, other aspects of the eruptions may also have been similar. The type section for this eruptive period was exposed before the 1992 rainy season in the scarp of a prominent terrace that extends several kilometers along the north bank of the Sacobia River, opposite and clearly visible from Marcos Village. 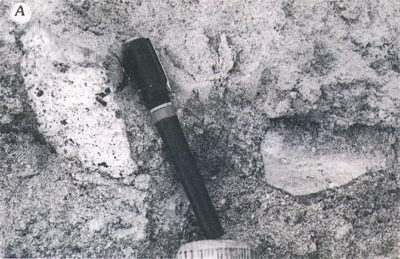 As of this writing, more than one-half (>10 m) of the early 1992 exposure had been buried by 1992 and 1993 infilling. Pasbul Eruptive Period -- ~9,000 yr B.P. Pyroclastic-flow and tephra-fall layers exposed along the road between Sitio Pasbul, Camias, Porac, and the Gumain River, including one pyroclastic-flow deposit with an age of 8380+-80 14C yr B.P. (sample 48-L; figs. 6, 7), represent a large eruption that overtopped the southeastern rim of the Tayawan caldera and nearly or completely filled the valley of the Gumain River. These deposits unconformably overlie pyroclastic-flow and debris-flow deposits of unknown modern Pinatubo age. The dated pyroclastic-flow deposit near Pasbul contains two pumice types, a dominant hornblende plagioclase porphyritic dacite and a subordinate, gray, finer grained pumice. Biotite occurs only as cores within hornblende phenocrysts, and relict olivine xenocrysts occur as rare cores within hornblende-magnetite reaction clots. Relatively low SiO2 (63-64%, table 2) and scarcity of quartz and biotite are distinguishing features of deposits of the Pasbul eruptive period. 1991 pyroclastic flows also overtopped the old caldera rim; at least one reached to within 2 km of Pasbul, but filled the Gumain canyon at its toe to a depth of only 2-4 m, much less than the 35-40 m of fill during the Pasbul eruptive period. A pumiceous pyroclastic-flow deposit in the Maraunot River watershed near Sitio Ugik, Villar, Botolan (47-P, figs. 6, 7), sampled and dated by Ebasco Services, Inc. (1977), was emplaced about 8050+-130 14C yr B.P. (calibrated age is about 8,980 yr B.P.). Chemical analyses of two clasts (samples 975-9w-4 and -5, Ebasco Services, Inc., 1977) indicate andesite and dacite; no details of mineralogy were given. Crow Valley Eruptive Period -- ~6,000-5,000 yr B.P. Deeply dissected pumiceous pyroclastic-flow deposits along both sides of upper Crow Valley, at and upstream from Bunker Hill (36,39,40,42-A; 38-B), form the most prominent exposures of major eruptions about 5,500 years ago (figs. 6, 7). These deposits form the basal and volumetrically largest part of Delfin's (1984) "Patal-Pinto pyroclastic-flow unit" but probably do not include younger deposits on which the village of Patal Pinto itself (destroyed in 1991) was built. Along Crow Valley, and in small valleys just to its west, we found evidence for at least four thick pyroclastic flows separated by erosional unconformities. The two oldest units occur in dissected, topographically high deposits along the walls of the valley. Of these, the lower unit is a crudely stratified, 20-m-thick, fines-poor pyroclastic-flow deposit with abundant charcoal (sample 40, section A, figs. 6, 7). The upper unit, as much as 40 m thick, contains at least three pyroclastic-flow layers. We could not reach the upper parts of this unit but we could see moist partings that could be thin soils or beds of relatively fine-grained ash. Two additional pyroclastic-flow deposits are found topographically below but stratigraphically above (?) the aforementioned 40-m-thick deposits, in recently eroded cuts into the valley floor. Of these, the lower is notably fines poor and yielded a 14C age of 5,100+-70 years (42-A, figs. 6, 7, table 1); the upper is a typically massive, poorly sorted pyroclastic-flow deposit that yielded a 14C age of 4,960+-70 (39-A, figs. 6, 7, table 1). Pyroclastic-flow deposits of the Crow Valley eruptive period also form prominent layers and terraces in the Sacobia River valley just outside the Mactan gate of Clark Air Base (34,35,37,44-C; figs. 6, 7). There, 20-m-thick deposits that underlie the terrace immediately below the gate on the south bank of the river correlate with a layer of similar thickness about two-thirds of the way up the northern valley wall, well above comparable 1991 deposits. Clasts in this layer show reversed polarity, presumably from self-reversal. Self-reversal occurred in both pumice types, coarsely and finely porphyritic, just as it did in 1991 pumice (R. Torres, oral commun., 1993). One and one-half kilometers upstream, the same unit is pinkish-gray, 20 to 24 m thick, with several flow units defined by concentrations of coarse pumice clasts. Fluvial and debris-flow deposits of the Crow Valley eruptive period at Poonbato (sample 43-Q, figs. 6, 7) underlay a terrace upon which a new church for Poonbato was under construction at the time of the 1991 eruption. The church and these deposits were later buried by 1992 lahars. The deposits were yellow-brown colored, slightly indurated, well stratified, and rich in pumice. Clasts of white, quartz-hornblende-plagioclase pumice dominated, but gray, less porphyritic, less vesicular pumice fragments were also present. The one pumice lump from these fluvial units that we examined in thin section, and by chemical analysis, is a low-SiO2 hornblende dacite, unlike other known pumice of the Crow Valley period and similar to that from the previous, Pasbul eruptive period. Fluvial deposits that underlie cane fields of Tarlac Province, including those of Hacienda Luisita, Mapalacsiao, were emplaced during the early part of this eruptive period (samples 41, 45, 46, fig. 7). Voluminous pyroclastic-flow deposits in the headwaters of the O'Donnell River were the source of these fluvial sediments that, today, form rich sandy loams well suited to sugar cane production. Although our dated samples 41, 45, and 46 came from 6 m below today's land surface on Hacienda Luisita, we have no evidence suggesting this area has been reburied by fluvial sediments of any younger eruptive period. To estimate the original volume of deposits of the Crow Valley eruptive period, we use the same method as used for the Inararo deposits. Pyroclastic-flow deposits of the Crow Valley eruptive period within the O'Donnell River watershed covered an area of about 20 km2 to an average depth of about 30 m, for a volume of about 0.6 km3. The 1991 pyroclastic-flow deposits in the same watershed were about 0.3 km3, or 0.05 of the total 1991 pyroclastic-flow deposit. If we assume the same azimuthal distribution of deposits then as in 1991, the volume of Crow Valley pyroclastic-flow deposits was about 12, or, rounding, between 10 and 15 km3. This estimate is approximate at best, but it is consistent with the observation that deposits of this eruptive period filled the lower Sacobia River valley to much greater depths than did those of 1991 and yet did not cover the more voluminous deposits of the Inararo eruptive period, between the Sacobia and Pasig-Potrero Rivers. Almost all pumice fragments sampled from deposits of the Crow Valley eruptive period are cummingtonite-bearing hornblende dacite; several also contain resorbed quartz and trace amounts of biotite. Cummingtonite occurs as relatively thick (>30 m) rims on hornblende phenocrysts. Two subtypes occur: phenocryst-rich white pumice and phenocryst-poor gray pumice, just as occurs in deposits of the Sacobia, Pasbul, and at least three younger eruptive periods. Both pumice types contain the same phenocryst minerals and are chemically similar, with 65-66% SiO2 (table 2). The fine-grained gray type contains dominantly broken crystal fragments rather than the mostly intact phenocrysts seen in the coarser grained white samples. Mingled pumices are a minor component in the deposits in Crow Valley proper; they are composed of white, cummingtonite-bearing dacite with large phenocrysts of plagioclase and hornblende interbanded with dark gray fine-grained hornblende andesite. Quench-textured andesite inclusions with sparse olivine xenocrysts are found in some pumice blocks. Maraunot Eruptive Period -- ~3,900(? )-2,300 yr B.P. The Maraunot eruptive period is defined by widespread, moderately well-preserved deposits of pyroclastic flows, lahars, and streamflow that have yielded ages from 3,590+-110 to 2,330+-110 14C yr B.P., or about 3,900-2,300 calendar yr B.P. (samples 16-33, sections B-D,G,I,K,O, and P of figs. 6, 7). We name this eruptive period for exposures of multiple pyroclastic flows along the Maraunot River, between 400 and 600 m above sea level (19,30-P). Pyroclastic flows also traveled far down the O'Donnell (17,22,31-B), Sacobia (27,29-G; 32-C), Abacan (fluvial sediments of this age occur at 20-I), Pasig-Potrero (lahar deposits of this age occur at 21-K), and Marella Rivers (28-O; related lahars at 23,25,26-O). Details on ages of this period are given in table 1. Except for samples 16-N and 33-N, all other samples that we use to define the Maraunot period (samples 17-32) are statistically indistinguishable from the nearest other age. Thus, some of the apparent spread of ages in the Maraunot period may be an artifact of sampling or dating and some, or even many, eruptions of this period may have occurred over shorter, more discrete periods than the centuries-long activity suggested by figure 5. Samples 16 and 33 make the Maraunot eruptive period seem about 600 yr longer than it would seem without those samples, and the apparent reposes between samples 16 and 17, and between samples 32 and 33, are of the same order as the repose from the Buag period to the present. Should these outlier ages be considered part of the Maraunot eruptive period? There is no clear petrologic affinity of pumice of unit 33-N to rocks of either the Maraunot or Crow Valley eruptive period; we do not have a rock sample from the 16-N unit. However, because sample 16 is much older than samples 1-15 (Buag period), and sample 33 is much younger than samples 34-46 (Crow Valley period), we leave them with the Maraunot period but alert readers to the possibility that the Maraunot period as we define it might actually include two or more shorter periods comparable to the Buag period. About 3,000 yr B.P., a series of eruptions produced the largest known pyroclastic flows of the Marella drainage (28-O). During the same period, other pyroclastic flows filled the Sacobia valley to such a depth that lahars and fluvial sediments spilled onto and covered most of today's Clark Air Base (18,24-D). The dominant pumice type in deposits of this eruptive period is cummingtonite-bearing hornblende dacite. Most of the analyzed samples have about 65% SiO2, although three samples from ~3,000-yr-B.P. pyroclastic-flow deposits near Bunker Hill (samples P3592-A, P3592-1B, and P3592-2C, table 2) are distinctly less evolved, with 62.1-62.5% SiO2. As in pumice of the preceding Crow Valley period, cummingtonite forms relatively thick (>30 m) rims on hornblende crystals. Biotite is present as a trace phase in most samples, and resorbed quartz is a minor component of all the dacite samples. Dacite pumice fragments with mingled andesite bands are present in several pyroclastic-flow deposits of the Maraunot eruptive period; the andesite bands are finer grained and contain resorbed olivine xenocrysts rimmed by hornblende. As in the products of other eruptive periods, the dacite pumice occurs in two forms--a dominant, white, coarsely vesicular, coarsely porphyritic pumice, and a subordinate, gray, finely vesicular, finer grained pumice (fig. 8A). Also, as in deposits of the other eruptive periods, the two pumice types in any single deposit contain identical phenocryst minerals and are chemically similar, but the finer grained type contains abundant broken crystal fragments. Figure 8. A, Phenocryst-rich (left) and phenocryst-poor pumice (right) from the Maraunot eruptive period. Eruptions of Pinatubo have repeatedly produced these same two types of pumice. B and C, Mingled andesite-dacite pumices from a pyroclastic flow deposit of the Buag eruptive period in the Pasig River channel. Dark bands are hybrid andesite with olivine and augite xenocrysts; light bands are cummingtonite- and biotite-bearing quartz hornblende dacite. Mingling of basaltic and dacitic magma occurred before many of the prehistoric eruptions of Pinatubo, and intrusion of basaltic magma into dacitic magma appears to be an important triggering mechanism of Pinatubo eruptions. How voluminous were deposits of the Maraunot eruptive period? Their deposits cover and may also be more extensive than those of the Crow Valley period on the northwest side of Mount Pinatubo, yet they did not bury Crow Valley-age deposits in Crow Valley itself. Although we have not yet confirmed deposits of the Maraunot eruptive period above those of the Crow Valley eruptive period in the north wall of the Sacobia valley (34,35-C), we suspect that Maraunot-age fill of that valley was at least as deep as fill of the Crow Valley eruptive period, because water-reworked deposits of the Maraunot eruptive period overflowed onto and covered the area of Clark Air Base (18-D), and no comparable evidence of Crow Valley-age overflow has been found. Thus, the bulk volume of deposits of the Maraunot eruptive period was roughly equal to that of the Crow Valley eruptive period, an estimated 10 to 15 km3. Buag Eruptive Period -- ~500 yr B.P. The latest pre-1991 eruptive period emplaced pyroclastic-flow deposits in all major watersheds of Mount Pinatubo except those of the Gumain and Porac Rivers. During our hasty preeruption reconnaissance, we found only a few primary deposits of this period: a pumiceous pyroclastic-flow deposit high in the Sacobia drainage, a little-dissected lithic-rich pyroclastic-flow deposit in the Marella drainage, and little-dissected pyroclastic-surge or blast deposits in the O'Donnell and Bucao watersheds, near and beneath the village of Patal Pinto. The 1991 eruption covered all of these deposits and, as of our posteruption reconnaissance in late 1991 and early 1992, erosion had not yet reexposed them. From these three primary deposits, only the pumiceous unit yielded charcoal (sample 4-G), with an age of about 500 yr B.P. The rest of our information about the Buag eruptive period comes from dated lahar, fluvial, and lake deposits that occur in the O'Donnell, Sacobia, Abacan, Pasig-Potrero, Marella, and Bucao River valleys. At face value, radiocarbon ages of pumiceous lahar deposits imply that explosive eruptions of this period began at least by 600 yr B.P. and perhaps as early as 800 yr B.P. However, our only reliable, in-situ sample that is older than about 500 yr is sample 10-J, an uncharred root of a tree that was apparently growing on the bank or floor of a deep, narrow channel and was killed by a flood or lahar. If that flood was related to Buag eruptions, then those eruptions began at least by 600 yr B.P. ; if the flood was of nonvolcanic origin, we cannot prove that the Buag eruptions lasted any longer than a few years or so. During the Buag period, lahars filled channels of the abovementioned rivers to levels equal to or slightly higher than 1991-93 fill. Because lahars of the Buag eruptive period filled the Abacan valley, and yet no primary deposits of this period have been recognized beyond the limits of 1991 deposits, we judge that eruption(s) of the Buag period were approximately the same size as that of June 15, 1991. In April and May 1990, archaeologists excavating a 13th-15th century site at Sitio Buag, Kakilingan, San Marcelino (sample 1-N, fig. 7), found pottery and other cultural relics, including charcoal from fires, mixed with ashy, pumice-bearing soil. This cultural layer was overlain by plowed soil and underlain by a second cultural layer and then several meters or more of "barren" ash and pumice, probably a lahar or pyroclastic-flow deposit (Zambales Archaeology Project, 1990; E. Dizon, National Museum, Manila, oral commun., 1992). A radiocarbon age of the charcoal (400+-70 14C years, or about 500+-50 years; sample 1-N, fig. 6, table 1) is consistent with the 13th to 15th century age determined independently by pottery typing. Our reading of Zambales Archaeology Project (1990) suggests that the site was built on pre-Buag deposits and abandoned but only lightly buried during Buag time, perhaps by a few tens of centimeters of ash fall. The site was covered by about 30 cm of tephra in 1991 but, as of this time of writing, can still be reexamined to learn the relation between Buag eruptions and the cultural occupation. If we assume for now that the Buag eruptions were the same size as those of 1991, we might have expected to see a large crater or small caldera in the pre-1991 summit, similar to that which formed during the current episode. No such crater existed in April 1991; indeed, the most notable feature of pre-1991 Pinatubo topography was a domelike summit area, from which there had been one or more moderate-size rock avalanches in recent decades or centuries. Furthermore, Pinatubo's youngest appearing, least dissected pyroclastic-flow deposit (uppermost unit of section M in the Marella valley) was rich in porphyritic, prismatically jointed lithic andesite (field number N600B, table 2), suggesting an origin by collapse of a lava dome, not a plinian eruption. We explain both the absence of a crater and the lithic character of this youngest pyroclastic-flow deposit by postulating that a large, late-stage dome filled the crater left by the penultimate plinian eruption, 500 yr B.P. Avalanches from this dome, while it was growing, generated the final pre-1991 pyroclastic flow. Regrettably, our only Buag rock samples are from dated lahars and the undated lithic pyroclastic-flow deposit. A lahar deposit of the Buag eruptive period in the Pasig River drainage contains blocks of biotite-, cummingtonite-, and quartz-bearing 65% SiO2 dacite pumice (samples P22592-2A, 2B, table 2; unit 15-J). Cummingtonite is present as relatively thin (<30 m) rims on hornblende crystals. Quartz and biotite are relatively abundant in several of dacite samples of the Buag eruptive period. However, in contrast to the biotite- and quartz- rich samples of the Inararo period, quartz phenocrysts in the Buag samples are resorbed. Mafic inclusions and mingled dacite pumice blocks (fig. 8 B,C) with dark olivine-augite bearing andesite bands and mafic inclusions are also present within this deposit. In contrast to the hybrid andesite of 1991, olivine crystals in samples of the Buag eruptive period lack hornblende reaction rims, their absence being suggestive of entrainment immediately prior to eruption. The late-Buag summit dome, represented by sample N600B from the undated but morphologically young lithic pyroclastic-flow deposit in the Marella valley, is a biotite- and quartz-bearing high-silica andesite (SiO2 62%) with highly resorbed xenocrysts of olivine and augite (both rimmed by hornblende). This disequilibrium mineral assemblage suggests that the pre-1991 summit dome represents a mixed magma, possibly analogous to the mixed andesite lava dome that, in 1992, began to refill the 1991 caldera (Daag, Dolan, and others, this volume). If the entire steep-sided edifice of pre-1991 Mount Pinatubo grew in the final stages of the Buag eruptive period, most of the lava flows, domes, and moat(?) sediments exposed in the 1991 caldera would be products of late-Buag eruptions. We doubt, but cannot disprove, this. It seems more likely to us that a Buag caldera was a relatively small summit caldera, formed in roughly the same area as that of 1991, and that what we see in the walls of the 1991 caldera are proximal products of many eruptive periods, perhaps spanning the entire history of the modern Pinatubo. To date, we have been unable to sample and map units exposed in the walls of the new 1991 caldera. As an interim product, we offer a panoramic sketch (fig. 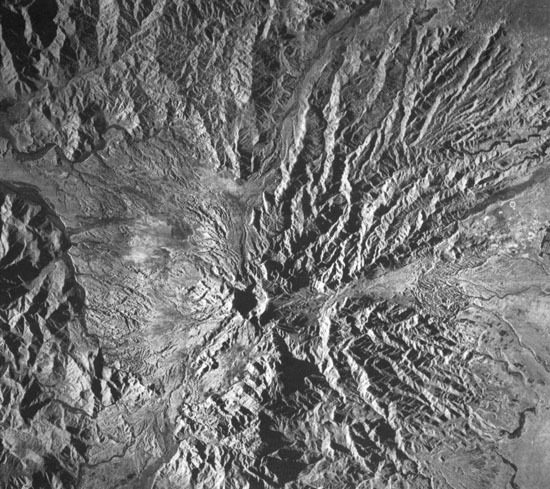 9), which was made from photos taken from various points inside the caldera from October 1991 to November 1992. From a distance, the 1991 caldera seems to lie in the summit of a stratocone (figs. 4A,B). From vantage points inside the caldera, many of the units appear stratified, with little apparent dip and considerable lateral continuity, some stretching almost halfway around the caldera (fig. 9). Stratified units are locally cut by domes and many small faults. Figure 9. Panoramic sketch of the walls of Pinatubo's 1991 caldera as seen from the center of the caldera. View (left to right, top, then bottom) is 360°, clockwise starting in the northeast sector. Broad units are as follows: D, light-colored, massive dome(s); L, weakly stratified, gray lavas and volcanic breccias; LD, a prominent, relatively dark breccia(?) within the larger L unit; CF, subhorizontally layered pre-1991 caldera fill; T1, 1991 explosion debris and talus, with subparallel rills being cut by rainfall and runoff on this unit only (that is, without influence by runoff from the larger, caldera walls); T2, 1991 explosion debris or talus showing complex, dendritic drainage patterns influenced by runoff from the caldera walls; T3, talus cones and deltas formed in late 1991, 1992, and 1993.
at least two pre-1991 domes (unit D, fig. 9), one in the northwest wall, immediately west of the Maraunot River, and the other in the north wall. Some of the 1991 explosion and collapse debris that coated the caldera walls in August 1991 (units T1 and T2 of fig. 9; see also, fig. 1A of Campita and others, this volume) is preserved as intricately rilled talus cones, and the balance has now been reworked into relatively undissected talus cones and broad, lake-filling deltas (T3). Numerous small faults, tens of meters long, occur but cannot be shown in figure 9. A major fault may cross the southeast wall, but its interpretation is complicated by a ridge and stepback in the wall that, in our photos, prevents distinction between a fault and an unfaulted, outward-dipping layer. Until there is complete mapping and lithologic description of the lavas, domes, and other deposits of the caldera walls, we cannot attempt any detailed correlation of those units with distal deposits of the eruptive periods described earlier. Only a few general remarks can be made. The steep-sided edifice of the pre-1991 Mount Pinatubo, within which the 1991 caldera formed, postdates the giant Inararo eruptions and formation of the Tayawan caldera. We suspect that the apparently sedimentary layers on the northeast wall represent infilling of a subsequent, Maraunot to Sacobia eruptive period caldera, whose northeastern wall was slightly outboard of the present caldera wall. We also suspect, but cannot prove, that the dome that is exposed high on the northwest side of the caldera is relatively young, because it is not overlain by any other unit. The Aeta people have lived around Mount Pinatubo for at least 400 years (Perez, 1680), probably longer, and on the mountain itself for at least 300 years, having been forced into the highlands by Spanish attempts to control them (Reed, 1904; Fox, 1952; Panizo, 1967; Brosius, 1983; Corpuz,1989; Shimizu, 1989). To our knowledge, they do not have an oral tradition of a previous eruption of Pinatubo. In Tagalog and in Sambal, the word "pinatubo" means "to make grow," so the name "Mount Pinatubo" might refer to a time when the mountain grew. Some of our Aeta field companions have mentioned this anecdotally, but it is difficult to know whether they would have suggested this origin for Mount Pinatubo's name before the dramatic events of 1991. More likely, "Pinatubo" refers to a fertile place where one can make crops grow. Several Aeta residents have reported to us that their "grandparents" (elders) recall minor explosions in the past. Small phreatic or hydrothermal explosions could well have occurred in past decades and centuries. Thermal areas of Pinatubo were first reported by Andal and others (1965), and small explosions in areas like these are common. The Philippine Commission on Volcanology (COMVOL) classified Mount Pinatubo as having solfataric activity in its 1981 Catalogue of Philippine Volcanoes and Solfataric Areas (COMVOL, 1981), and COMVOL's successor, the Philippine Institute of Volcanology and Seismology (PHIVOLCS), re-classified Pinatubo as "potentially active" (PHIVOLCS, 1988). The only documented incident of unrest before 1991 occurred on August 3, 1990, about 2 weeks after a major, Ms = 7.8 earthquake occurred about 100 km to the northeast of Pinatubo. 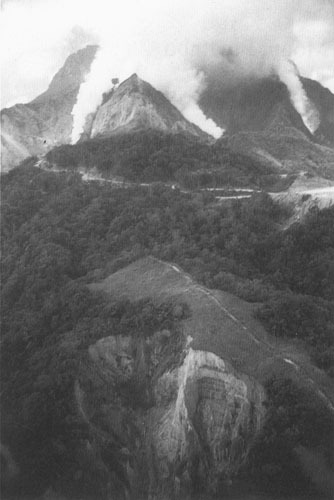 According to Isada and Ramos (1990), a large ground fracture and steam emission noticed by residents on August 3 resulted from a landslide on the upper northwest side of the volcano, along the Maraunot fault in an area of preexisting solfataric activity (see also, Sabit and others, this volume). Virtually all of the prehistoric deposits we have examined represent eruptive phenomena seen anew in 1991-92. Pumiceous pyroclastic-flow deposits, with minor volumes of lithic pyroclastic-flow deposits and pumiceous tephra-fall deposits, dominate deposits on the middle slopes of the volcano. In the alluvial apron of Pinatubo, pumiceous lahar and streamflow deposits formed during every prehistoric eruptive period, as they do today. In addition, andesite to dacite lavas formed a number of prehistoric domes, especially late in eruptive periods, akin to that which began to form in 1992 (Daag, Dolan, and others, this volume). In short, Pinatubo stews, explodes, and heals itself in what, over millennia, may be a steady-state process. The volcano never grows very large, because it produces mostly unwelded, easily erodible deposits, and periodically destroys the viscous domes that fill its vents. Will basaltic magma that intruded and mixed with dacitic magma before June 1991 be erupted? Probably not. Similar mixing events took place repeatedly throughout the history of modern Pinatubo, but did not lead to eruption of basaltic lavas that have been preserved in the geologic record. A large (~50-90 km3) magma body is inferred from the distribution of hypocenters and tomographic modelling of 1991 earthquakes beneath Pinatubo (Mori, Eberhardt-Phillips, and Harlow, this volume). This large body could have existed throughout the modern history of the volcano. If so, this body has surely been sustained by the periodic influx of mafic magma, and has apparently blocked ascent of any significant volume of basaltic magma to the surface. For issues of public safety and planning, we need to ask how much longer the present eruption will continue and whether Mount Pinatubo can produce two or more large explosive eruptions within a single eruptive period, especially within the next several years to decades. In other words, is there anything in the geologic record that would corroborate, or argue against, the hope of residents that the worst of the present eruptive period has passed? Taken at face value, radiocarbon ages in table 1 and figure 5 suggest that eruptive periods have lasted decades and perhaps as much as several centuries. Because many of the ages from the Crow Valley and Maraunot periods are of charcoal in pyroclastic-flow deposits and vary (from the beginning to the end of each period) by more than the 1-sigma standard deviation of their calibrated ages (fig. 5), one might infer that at least the youngest and oldest ages of each period represent separate eruptions. However, due to the potential for interior wood or wood from an older deposit to be incorporated into a new deposit, discussed earlier, we cannot be sure that the older ages of each eruptive period are truly ages of eruptions. Thus, from the range of 14C ages alone, we cannot infer that eruptive periods lasted any more than a few years or decades, and we cannot tell whether they included multiple large eruptions. Several high, near-vertical gully walls show multiple pyroclastic-flow units in Crow Valley and in the Sacobia and Marella valleys. Thin partings between flow units are highlighted by grasses (and soil?). In the Sacobia, we obtained ages for the topmost units but not for the base; in Crow Valley we obtained ages for the basal units but couldn't reach the upper units. In both cases, a similarity of distribution and general appearance (and, in the case of Crow Valley units, similarity also in lithology; table 2) suggests that these might represent multiple eruptions of the same eruptive period, but we cannot prove this suggestion. Only two field scenarios would be compelling evidence for multiple large explosive eruptions within a single eruptive period. The first would be an outcrop with multiple pyroclastic-flow or tephra-fall deposits and in-situ outer wood ages for the top and bottom units of that outcrop that are statistically different yet within the same eruptive period. The second would be an outcrop with multiple pyroclastic-flow or tephra-fall deposits that are separated by soils, yet having in-situ ages for the top and bottom units from the same eruptive period. We looked in vain for such evidence. Instead, we found numerous examples of multiple pyroclastic-flow deposits, some with intervening soils and some without, but none with datable wood or charcoal, much less in-situ datable material, top and bottom in the same outcrop or section, to tell us whether the top and bottom units were from separate eruptions of a single eruptive period. In Crow Valley at least two and possibly three or more voluminous pyroclastic-flow deposits of the Crow Valley eruptive period, distinguished in the field, yield ages that are indistinguishable (38-B, 39,40A). Similarly, in the Maraunot River valley, ages of at least two pyroclastic-flow deposits (19,30-P) are statistically indistinguishable. The lack of confirmed paleosols between these units means that they could have been from single eruptions; at the same time, the uncertainty in 14C ages also allows that they could have been from multiple eruptions within those two eruptive periods. Thus, our reconnaissance geologic data do not prove that previous eruptive periods lasted any longer than the present one, nor do they tell us whether additional explosive eruptions are likely. The data do tell us of much more postcaldera dome growth than has occurred since 1991, and they hint of multiple explosive eruptions within single eruptive periods. Therefore, continued close volcano surveillance is still required as of this time of writing. Decreasing Eruption Size through Time? Valley walls show evidence for cut and fill during all recent eruptive periods, and uniformitarianism argues that similar cut and fill has probably occurred throughout the history of Mount Pinatubo. However, rather than progressive aggradation with local cut and fill, and thus a concentration of younger units at the top of the volcanic pile, the deposits of the highest-standing fan surfaces and terraces tend also to be the oldest. In the lower Sacobia, Pasig-Potrero, and Gumain Rivers, deposits of the Maraunot, Crow Valley, and Pasbul eruptive periods are exposed high on valley walls, beneath high terraces, well above those of 1991-93. Evidence of pyroclastic-flow runout suggests that pyroclastic flows of the Maraunot, Crow Valley, and Pasbul eruptive periods traveled farther than those of the Buag and 1991 eruptions. Together, depths of valley filling and distances of runout suggest that older recognized eruptions of Pinatubo really were larger than those of the Buag period and 1991. Thus, we think the oldest eruption of modern Pinatubo was also its largest (Inararo, >35,000 yr B.P. ; about 5 times as large as that of 1991). Those of the Pasbul period were as energetic, if not as voluminous, as the Inararo eruptions. Although smaller than the Inararo eruptions, those of the Crow Valley and Maraunot periods were still about 2 to 3 times as big as that of 1991. Eruptions of the Buag period were roughly the same size as those of 1991 and significantly smaller than those of the Inararo, Crow Valley, and Maraunot periods. The word "recognized" is highlighted as a caution. On any volcano, erosion of some deposits and burial of others will bias the outcrops to those of younger eruptions. The older eruptions that are most likely to be recognized will be the largest ones. It is certainly possible that many eruptions of the size of that of 1991 or the penultimate, Buag eruptions also occurred during, or even between, the older eruptive periods and that their deposits are not recognized today. Uncertainties about erosion and burial prevent us from judging whether every eruption, or even the average size of eruptions, is getting smaller. What we can say with reasonable confidence is that the size of the largest eruption(s) of each eruptive period is diminishing. The similarity in mineral assemblages, textures, and chemical compositions of dacites erupted at Pinatubo over the past >35,000 yr suggests that the 1991 magmas are similar to those of the past (Pallister and others, 1993). With few exceptions, the magma body cooled to the point that cummingtonite was stable (<800 C and PH2O<4 kbar; Rutherford and others, this volume) prior to each eruption. Shortly before and following each eruption, the body was apparently replenished and reheated by influx of basaltic magma (Pallister and others, 1993; this volume). Given this similarity, might not the previous eruptions, many of which were likely larger than those of 1991, have also vented large amounts of SO2 to the atmosphere? We think the answer may be "yes"; however, direct evidence of high sulfur contents is lacking. As has been noted by many workers, the June 15, 1991, eruption injected about 20 Mt of SO2 into the stratosphere (Bluth and others, 1992), which has had a measurable impact on global climate (Hansen and others, 1992; Self and others, this volume). Yet, the evidence of a high sulfur content in 1991 eruption products is ephemeral. The 1991 magma was water saturated, and much of the sulfur was present in a separate gas phase, inferred from but no longer seen in erupted products (Westrich and Gerlach, 1992; Gerlach and others, this volume). In addition, any anhydrite that is present is quickly dissolved by ground water (Luhr and others, 1984; Bernard and others, 1991, this volume). Although the similarity in composition and mineral paragenesis suggests that many previous magmas at Pinatubo evolved under similar conditions, none of the pre-1991 samples we have examined is enriched in whole-rock sulfur content, and we have not identified anhydrite in thin sections of pumices. Additional work and new methods are needed to find a "fingerprint" of ancient sulfur-rich eruptions, possibly in the sulfur content of apatite crystals, and of glasses within apatite crystals (J. Luhr, Smithsonian Institution, written commun., 1993; Pallister and others, 1993; see also Imai and others, this volume). The eruptive history of Pinatubo is one of several guides to its future. Seven of the preceding observations are especially pertinent to judging future volcanic hazards. Pinatubo eruptions occur episodically and last for periods much shorter than the repose intervals between them. Some eruptive periods appear to include multiple large explosive eruptions, but we cannot resolve the time period over which they occurred. 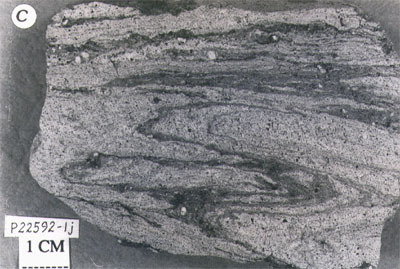 Pinatubo erupts large volumes of remarkably consistent, relatively cool and crystal-rich cummingtonite-bearing dacite magma, suggesting continual presence of a large and relatively shallow (<12km) magma body that is capable of eruption only when sufficient volatile- and crystal-rich magma evolves. Evidence of mixing of mafic magma with dacite is found in deposits of many of the previous eruptive periods and may have triggered those eruptions, just as inferred by Pallister and others (1991; this volume) for the 1991 eruption. The 1991 eruption of Pinatubo was among the smallest we can document in its geologic record. Eruptions appear to have been decreasing in size through the >35,000-yr history of modern Pinatubo, but this might be an artifact of erosion and (or) burial of older deposits. More certainly, the maximum size of eruptions in each eruptive period has been getting smaller. The 500-year repose between the Buag and present eruptive periods is among the shorter repose periods that we can recognize in the geologic record, but, again, this may be an artifact of erosion and (or) burial of older deposits. At least the penultimate Pinatubo eruption ended with growth of a large lava dome. The inference of a large magma body beneath Mount Pinatubo and the observation that the 1991 eruption was relatively small by Pinatubo standards might be taken as evidence that additional, possibly larger, eruptions are possible. We cannot rule out that possibility. However, the observations of generally decreasing eruption size over time, and apparently shorter and shorter repose intervals, if not artifacts of preservation and exposure, suggest instead that the 1991 eruption was the biggest that could be mustered from the 1991 and present magma body, perhaps because it had been recharged with volatiles for only 500 years. Nonexplosive growth of a lava dome in 1992 corroborates that inference. The 1991 eruption might have been triggered "prematurely" by the July 16, 1990, Luzon earthquake (B.C. Bautista and others, this volume), before the usual large volume of magma could become volatile saturated. If so, no additional large explosive eruptions would be expected. An alternative interpretation of the general decrease in eruption size, namely that there has been prolonged overall cooling and a corresponding decrease in the volume of the magma body, would also lead to the same conclusion, which is that an explosive eruption on the scale of the June 15, 1991, eruption is unlikely to recur at Mount Pinatubo within our lifetimes. Will the present eruptive period be short and, from now until its end, wholly nonexplosive? The late-Buag dome was large and, by comparison with other domes of the world, probably took several years if not decades or centuries to grow. To the extent that geologic history is a reliable guide to the future, we can expect more dome growth. Would such growth be wholly nonexplosive? The geologic record we have seen does not exclude the possibility of alternating dome growth and explosive eruptions during a single eruptive period, ending with dome growth. Indeed, alternating dome growth and explosive eruptions have been documented at Mount St. Helens (Pallister and others, 1992), where eruptions are smaller but otherwise similar to those of Pinatubo. We do not expect another explosive eruption as large as that of June 15, 1991, but we would not be surprised to see some moderate-size explosive events. In summary, the geologic record suggests that the present eruption might not be finished, but it also suggests that the most likely style of eruption for the next several decades is continued dome growth, with or without moderate-size explosive interludes. As always, the key to shorter term forecasts will be careful seismic and related monitoring. We thank USAID/Philippines, USAID/OFDA, Mayor Richard Gordon of Olongapo City, the Philippine Air Force, and U.S. military forces in the Philippines for financial and logistical support. We also thank Ed Wolfe and William Scott for constructive reviews of this report, and Intera Information Technologies for preeruption and posteruption SLAR images (figures 4A and B). Andal, A., Datuin, R., and Arciga, V., 1965, Investigation of solfataric field near Mt. Pinatubo: Quezon City, COMVOL [Commission on Volcanology] Annual Report for 1965, p. 111-112. Aniceto-Villarosa, H.G., Lapuz, R.G., and Pagado, E.S., 1989, Geology and petrology of well PIN-1: Philippine National Oil Company, unpublished report, 23 p.
Bautista, B.C., Bautista, M.L.P., Stein, R.S., Barcelona, E.S., Punongbayan, R.S., Laguerta, E.P., Rasdas, A.R., Ambubuyog, G., and Amin, E.Q., this volume, Relation of regional and local structures to Mount Pinatubo. Bernard, A., Demaiffe, D., Mattielli, N., and Punongbayan, R.S., 1991, Anhydrite-bearing pumices from Mount Pinatubo: Further evidence for the existence of sulfur-rich silicic magmas: Nature, v. 354, p. 139-140. Bernard, A., Knittel, U., Weber, B., Weis, D., Albrecht, A., Hattori, K., Klein, J., and Oles, D., this volume, Petrology and geochemistry of the 1991 eruption products of Mount Pinatubo. Bluth, G. J. S., Doiron, S. D., Schnetzler, C. C., Krueger, A. J., and Walter, L. S., 1992, Global tracking of the SO2 clouds from the June, 1991 Mount Pinatubo eruptions: Geophysical Research Letters, v. 19, p. 151-154. Brosius, J.P., 1983, The Zambales Negritos: Swidden agriculture and environmental change: Philippine Quarterly of Culture and Society, v. 11, p. 123-148. Bruinsma, J.W., 1983, Results of potassium-argon age dating on twenty rock samples from the Pinatubo, southeast Tongonan, Bacon-Manito, Southern Negros, and Tongonan, Leyte areas, Philippines: Proprietary report by Robertson Research Ltd. to the Philippine National Oil Company-Energy Development Corporation, 24 p.
Commission on Volcanology (COMVOL), 1981, Catalogue of Philippine volcanoes and solfataric areas: Quezon City, COMVOL, unpaginated. Corby, G.W., and others, 1951, Geology and oil possibilities of the Philippines. Republic of the Philippines: Department of Agriculture and Natural Resources, Technical Bulletin 21, 363 p.
Corpuz, O.D., 1989, The roots of the Filipino Nation: Quezon City, AKLAHI Foundation, Inc., 2 v., 615 and 744 p.
Cruz, A., 1981, Pumice and other pumiceous materials in the Philippines: Philippine Bureau of Mines and Geosciences, Technical Information Series, Publication 43-81, 23 p.
Daag, A.S., Dolan, M.T., Laguerta, E.P., Meeker, G.P., Newhall, C.G., Pallister, J.S., and Solidum, R., this volume, Growth of a postclimactic lava dome at Mount Pinatubo, July-October 1992. Datuin, R., 1982, An insight on Quaternary volcanoes and volcanic rocks of the Philippines: Journal of the Geological Society of the Philippines, v. 36, p. 1-11.
de Boer, J., Odom, L.A., Ragland, R.C., Snider, F.G., and Tilford, N.R., 1980, The Bataan orogene: Eastward subduction, tectonic rotations, and volcanism in the western Pacific (Philippines): Tectonophysics, v. 67, no. 3-4, p. 251-282. Defant, M.J., Maury, R.C., Ripley, E.M., Feigenson, M.D., and Jacques, D., 1991, An example of island-arc petrogenesis: Geochemistry and petrology of the southern Luzon Arc, Philippines: Journal of Petrology, v. 32, p. 455-500. Delfin, F.G., Jr., 1983, Geology of the Mt. Pinatubo geothermal project: Philippine National Oil Company, unpublished report, 35 p. plus figures. ------1984, Geology and geothermal potential of Mt. Pinatubo: Philippine National Oil Company, unpublished report, 36 p.
Delfin, F.G., Jr., Sussman, D., Ruaya, J.R., and Reyes, A.G., 1992, Hazard assessment of the Pinatubo volcanic-geothermal system: Clues prior to the June 15, 1991 eruption: Geothermal Resources Council, Transactions, v. 16, p. 519-527. Delfin, F.G., Jr., Villarosa, H.G., Layugan, D.B., Clemente, V.C., Candelaria, M.R., Ruaya, J.R., this volume, Geothermal exploration of the pre-1991 Mount Pinatubo hydrothermal system. Ebasco Services, Inc., 1977, Philippine Nuclear Power Plant I: Preliminary Safety Analysis Report, v. 7, section 2.5.H.1, Appendix, A report on geochronological investigations of materials relating to studies for the Philippine Nuclear Power Plant Unit 1. Fox, R.B., 1952, The Pinatubo Negritos: their useful plants and material culture: Philippine Journal of Science, v. 81, no. 3-4, p. 173-414. Gerlach, T.M., Westrich, H.R., and Symonds, R.B., this volume, Preeruption vapor in magma of the climactic Mount Pinatubo eruption: Source of the giant stratospheric sulfur dioxide cloud. Hansen, J., Lacis, A., Ruedy, R., and Sato, M., 1992, Potential climate impact of Mount Pinatubo eruption: Geophysical Research Letters, v. 19, p.215-218. Hawkins, J.W., and Evans, C.A., 1983, Geology of the Zambales Range, Luzon, Philippine Islands: Ophiolite derived from an island arc-back arc basin pair, in Hayes, D.E., ed., The tectonic and geologic evolution of Southeast Asian seas and islands, part 2: American Geophysical Union Monograph 27, p. 95-123. Imai, A., Listanco, E.L, and Fujii, T., this volume, Highly oxidized and sulfur-rich dacitic magma of Mount Pinatubo: Implication for metallogenesis of porphyry copper mineralization in the Western Luzon arc. Isada, M., and Ramos, A., 1990, Mt. Pinatubo not erupting: PHIVOLCS Observer, v. 6, no. 3, p. 6. Jagolino, R., 1973, Geologic investigation of sulfur and other minerals, Mt. Pinatubo area, Zambales and Tarlac: Philippine Bureau of Mines, unpublished report. Jordana y Morera, R., 1885, Bosquejo Geografico e Historico-Natural del Archipielago Filipino: Madrid, Imprenta de Moreno y Roxas, 461 p.
Luhr, J. F., Carmichael, I. S. E., and Varekamp, J. C., 1984, The 1982 eruptions of El Chichón volcano, Chiapas, Mexico: Mineralogy and petrology of the anhydrite-bearing pumices: Journal of Volcanology and Geothermal Research, v. 23, p. 69-108. Oebbeke, K., 1881, Beiträge zur Petrographie der Philippinen und der Palau-Inseln: Neues Jahrbuch für Mineralogie, Beilage-Band I, p. 451-501. Pallister, J.S., Hoblitt, R.P., Crandell, D.R., and Mullineaux, D.R., 1992, Mount St. Helens a decade after the 1980 eruptions: Magmatic models, chemical cycles, and a revised hazards assessment: Bulletin of Volcanology, v. 54, no. 2, p. 126-146. Pallister, J.S., Hoblitt, R.P., and Reyes, A.G., 1991, A basalt trigger for the 1991 eruptions of Pinatubo volcano? : Nature, v. 356, p. 426-428. Pallister, J.S., Meeker, G.P., Newhall, C.G., Hoblitt, R.P., and Martinez, M, 1993, 30,000 years of the "same old stuff" at Pinatubo [abs. ]: Eos, Transactions, American Geophysical Union, v. 74, no. 43, p. 667-668. Panizo, Fr. A., O.P., 1967, The Negritos or Aetas: Unitas, v. 40, no. 1, p. 66-101. Perez, Fr. Domingo, O.P., 1680, Relation of the Zambals, in Blair, E.H., and Robertson, J.A., 1903-1909, The Philippine Islands 1493-1898, v. 47: Cleveland, Arthur H. Clarke Co., p. 292. Philippine Bureau of Mines, 1963, Geological map of the Philippines, Sheet ND-51, City of Manila: Manila, Philippine Bureau of Mines, scale 1:1,000,000. 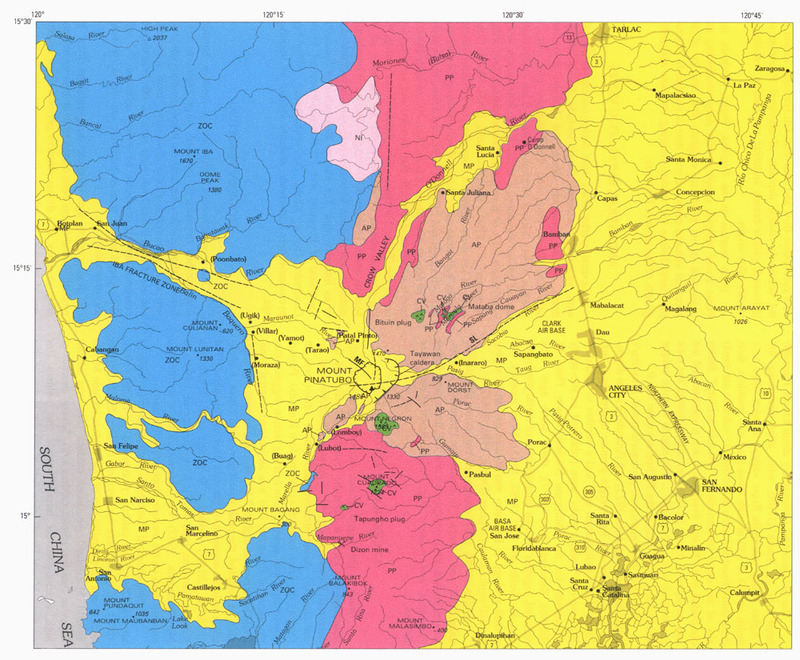 Philippine Bureau of Mines and Geosciences, 1982, Geological map of the Sta. Juliana quadrangle, Tarlac province: 1:50,000, 1 sheet. Philippine Institute of Volcanology and Seismology (PHIVOLCS), 1988, Distribution of active and inactive volcanoes in the Philippines: Quezon City, PHIVOLCS, educational poster, 1 sheet. Reed, W.A., 1904, Negritos of Zambales: Manila, Ethnological Survey Publications, U.S. Department of Interior, v. 2, pt. 1, 90 p.
Roque, V.P., Jr., Reyes, B.P., and Gonzales, B.A., 1972, Report on the comparative stratigraphy of the east and west of the mid-Luzon Central Valley, Philippines: Mineral Engineering Magazine, Philippine Society of Mining, Metallurgical, and Geological Engineers, v. 24, p. 11-62. Schweller, W.J., Karig, D.E., and Bachman, S.B., 1983, Original setting and emplacement history of the Zambales ophiolite, Luzon, Philippines, from stratigraphic evidence, in Hayes, D.E., ed., The tectonic and geologic evolution of Southeast Asian seas and islands, part 2: American Geophysical Union Monograph 27, p. 124-138. Scott, W.E., Hoblitt, R.P., Torres, R.C., Self, S, Martinez, M.L., and Nillos, T., Jr., this volume, Pyroclastic flows of the June 15, 1991, climactic eruption of Mount Pinatubo. Self, S., Zhao, J-X., Holasek, R.E., Torres, R.C., and King, A.J., this volume, The atmospheric impact of the 1991 Mount Pinatubo eruption. Shimizu, H., 1989, Pinatubo Aytas: Continuity and change: Quezon City, Ateneo de Manila Press, 185 p.
Smith, R.L., 1979, Ash-flow magmatism, in Chapin, C.E., and Elston, W.E., eds., Ash-flow tuffs: Geological Society of America Special Paper 180, p. 5-27. Smith, W.D., 1909, Contributions to the physiography of the Philippine Islands: IV. The country between Subig and Mount Pinatubo: Philippine Journal of Science, v. 4(A), p. 19-25. Stuiver, M., and Reimer, P.J., 1993, Extended 14 C database and revised CALIB radiocarbon calibration program: Radiocarbon, v. 35, p. 215-230. Villones, R., 1980, The Aksitero Formation: Its implications and relationship with respect to the Zambales ophiolite: Philippine Bureau of Mines and Geosciences, Technical Information Series, no. 16-80, 21 p.
von Drasche, R., 1878, Datos para un estudio geologico de la isla de Luzon (Filipinas): Boletin de la Comision de Mapa de España, v. 8, p. 269-342. Westrich, H. R., and Gerlach, T. M., 1992, Magmatic gas source for the stratospheric SO2 cloud from the June 15, 1991 eruption of Mount Pinatubo: Geology, v. 20, p. 867-870. Wolfe, J.A., and Self, S., 1983, Structural lineaments and Neogene volcanism in southwestern Luzon, in Hayes, D.E., ed., The tectonic and geologic evolution of Southeast Asian seas and islands, pt. 2: American Geophysical Union Monograph 27, p. 157-172. ------1983, Subduction, arc volcanism and hydrothermal mineralization: The Manila Trench sector, Philippines: Philippine Journal of Volcanology, v. 1, no. 1, p. 11-40. Zambales Archaeology Project, 1990, Archaeological report on Manggahan 2, Kakilingan, Buag, San Marcelino, Zambales: Manila, National Museum, unpublished report, 28 p.